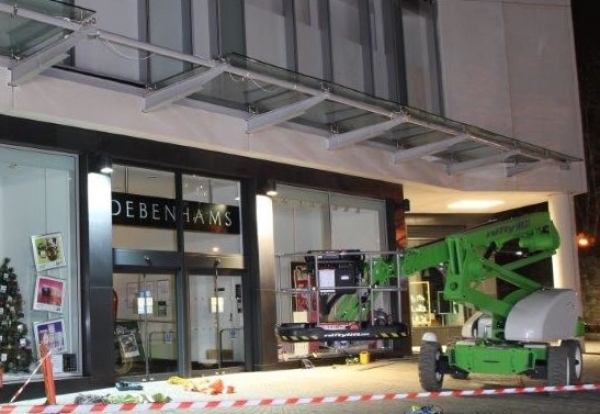 Sir Robert McAlpine and a glazing contractor have been sentenced after a worker fell to his death from a store front in Exeter. Philip Evans was working for subcontractor London Fenestration Trades Ltd on the Sir Robert McAlpine job to repair a glass façade above an entrance to a department store in Exeter on 9th November 2011. While a colleague worked on a higher part of the curtain wall from a mobile working platform, Evans worked from the glass canopy to attach the lower fixings. 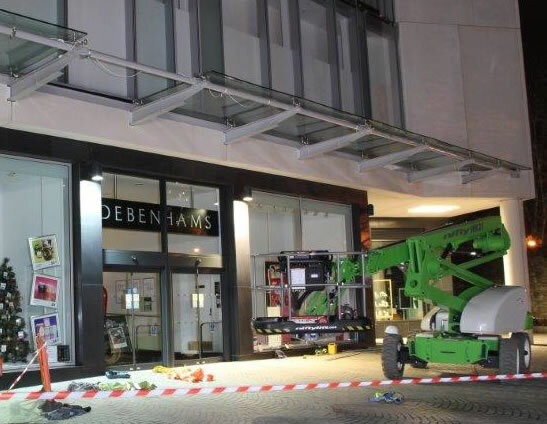 During the course of this work, he walked along the canopy from right to left and fell through an opening above the Bedford Street entrance of the Debenhams store. During the HSE prosecution Exeter Crown Court heard the opening had been created during previous maintenance works when a pane of glass was removed from the canopy and had not been replaced. Evans, from Penarth, South Glamorgan fell approximately 4.5metres through the canopy on to the granite setts below. He received serious injuries as a result of the fall and died later in hospital. The subsequent HSE investigation found the mobile platform provided was inadequate for the work being carried out. The glass canopy on which Evans was working was not a safe working platform as there was no edge protection and there was the large opening through which he subsequently fell. The court was also told neither of the two workers should have left the safety of the working platform basket. HSE inspector Jonathan Harris said: “The risks associated with work at height are very well known and recognised in readily available guidance. “Planning and effective coordination between contractors is a requirement of the relevant safety regulations. “Without such planning and sufficient assessment of risk, it is foreseeable that working at height will expose operatives to risks to their safety. “In this case Mr Evans was working from an unsafe position which exposed him to the potential of falling from the edge of the glass canopy as well as the opening through which he tragically fell. London Fenestration Trades Ltd of Grangetown, Cardiff also pleaded guilty but as the firm is in liquidation the court could only notionally fine it £200,000 with £17,790 costs.